This is not your average dessert recipe. Usually, desserts only give us sugar and fats that lead to high cholesterol, obesity, and even diabetes. Instead, this dessert can help to prevent memory loss, dementia and an anxiety problem that you may be experiencing. With ingredients like coconut oil that has been found to help heal various chronic illnesses, we no longer have to skip dessert to be healthy. In fact, letting ourselves indulge in this creamy chocolate mousse might actually be the healthier option. Who knew bad could be so good? Coconut oil is a versatile ingredient that can reverse and prevent a variety of serious illnesses. Coconut oil can help better our brain function, our heart and almost every other part of our body. Coconut oil‘s fatty acids contain the good kind of fat (saturated fat) that our body needs. These fatty acids are metabolized in our bodies in a way that can actual aid and has therapeutic effects on several brain disorders. The fatty acids in coconut oil can also help prevent infections. Medium-chain fatty acids found in coconut oil help reduce our appetite while simultaneously keeping us energized. As a result, consuming coconut oil can help you lose weight. Studies have shown that the fatty acids in coconut oil also improve cholesterol levels which can help reduce the risk of heart disease. This recipe is shared with permission from our friends at paleomazing.com. This is an easy, make-ahead, creamy chocolate mousse dessert that both kids and adults love. It is delicious as-is or go ahead and splurge and serve it dressed up a little. In a small bowl, whisk together the vanilla extract and water. Sprinkle the gelatin over the top and set aside to bloom for 10 minutes. Combine the honey, cacao powder, and ghee in a small saucepan over medium heat. Bring just to a boil, whisking frequently, then remove from the heat. Stir in the gelatin mixture and whisk again until smooth and well combined. Set aside. In a large mixing bowl, beat the coconut cream with a hand mixer on medium speed for 1 minute. Slowly pour in the chocolate mixture and continue to beat until combined. Taste and add more cacao powder if you want a stronger chocolate taste, blending with the hand mixer until fully combined. Spoon into bowls or glasses. Serve with whipped coconut cream and fresh berries if desired. Enjoyed these creamy mousse recipes? 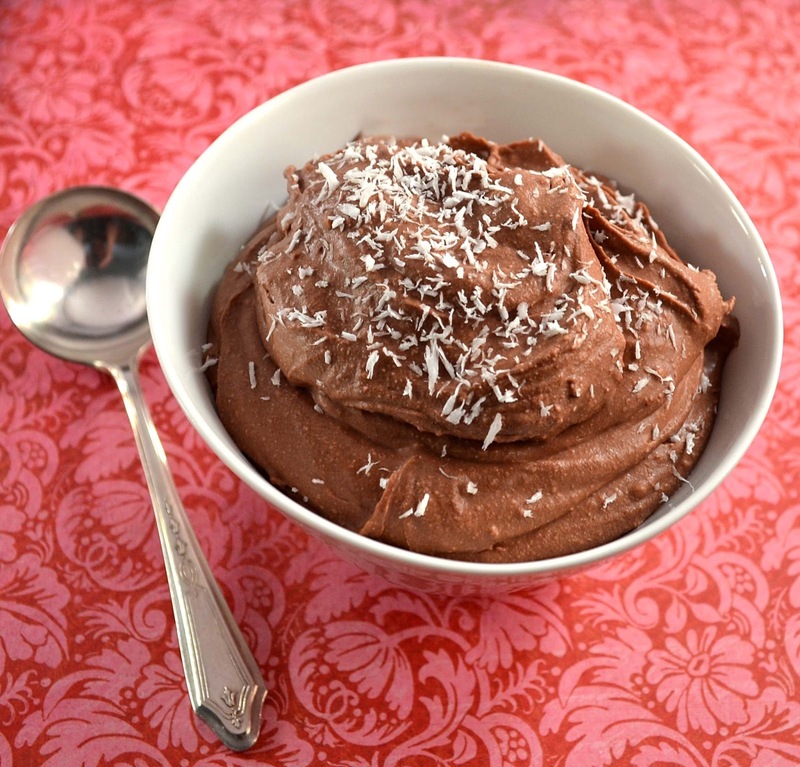 Give these a try – Vegan Chocolate Mint Mousse and Coconut Chocolate Mousse!